This is one area of the world that is definitely on my “I’ve got to get back there” list. British Columbia, Canada. In 2004 we did a family reunion to that area. We flew into Vancouver and then all (my Aunts/Uncle/cousins/Dad/Nana) met in Whistler for nearly a week of fun times together. We tacked on several days in Vancouver and did a day trip out to Victoria…. 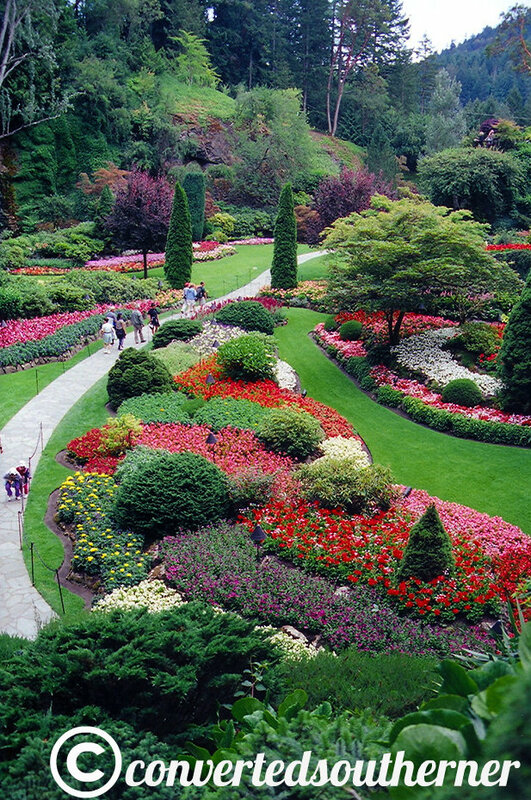 which is where we got to see Butchart Gardens. This is actually probably one of the last vacations where I shot only in film… I fully moved into digital after this. So, to be clear… the whole damn province is beautiful. I would move there in a heartbeat. But I really loved my visit to Butchart Gardens. It is an old quarry that was turned into a lovely garden for acres and acres by the family after the quarry years were done. It is simply stunning and this photo of the entrance to the sunken garden just does not do it justice. Go visit! But it gets cold and snows there. You’d never survive. True. I could make it may to October!